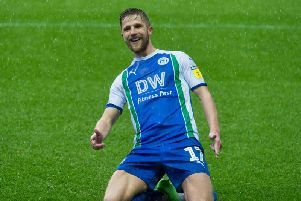 Wigan Athletic boss Paul Cook has been hit with a triple hammer blow ahead of this weekend’s crucial clash at Bristol City. Michael Jacobs is out for the rest of the season with the hamstring injury he sustained against Brentford last weekend. Callum McManaman - out of contract this summer - may have played his last game for the club after undergoing hernia surgery. And Gary Roberts has also been sidelined with a calf problem picked up in training. “Michael Jacobs now looks like he’s out for the season, which is a massive blow,” reported Cook. “Callum McManaman’s gone in for a hernia operation this morning, which he’s been carrying for a period of time. “He’ll probably be out for four weeks, which is another blow, but his future in the game is the most important thing. “Gary Roberts is also out with a calf injury, and it is what it is. “But that’s part and parcel of football, and it gives opportunities for other lads to come in and show what they can do. “That’s something you can’t factor in a a manager, and that’s not me trying to make excuses. “But when a club like us losing players of that calibre, it will have an adverse effect.